This 1st Grade project we call, “Don’t Bug Me.” We use pre-cut shapes in assorted colors, google eyes, feathers, sequins and glue dots to make imaginary bugs. The kids love doing this and giggle alot while doing it. 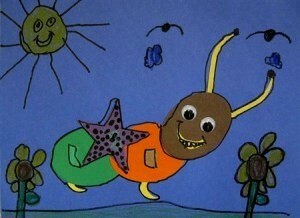 Directions for “Don’t Bug Me“are in the 1st Grade Projects Gallery in the sidebar. This entry was posted in 1st Grade and tagged 1st grade, arts and crafts for kids, bug art, classroom art project, dont bug me, for kids, shapes, working with shapes. Bookmark the permalink.